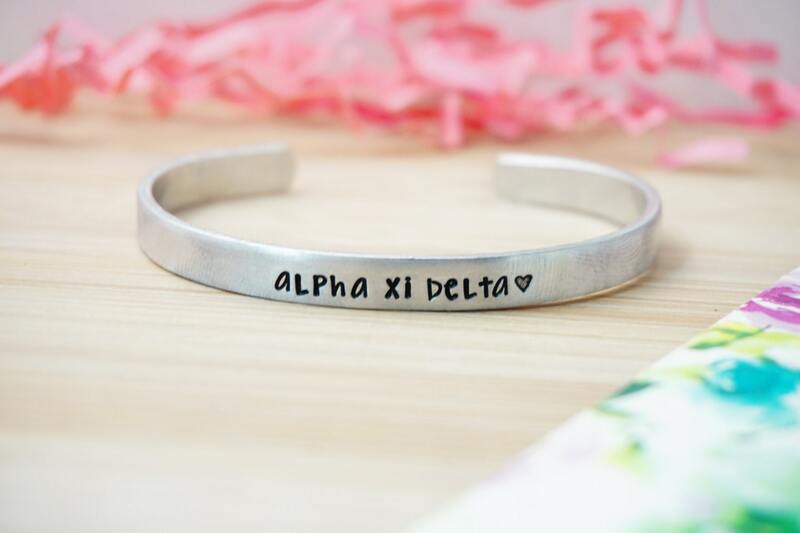 Beautiful Official Licensed Product Sorority bracelet features a 1/4" x 6" cuff bracelet stamped with your sorority name and a heart. Please select your organization from the drop down menu. leave your text (max 20 characters) in the notes at checkout. Cuffs are made of 12 gauge aluminum which is a lightweight, hypoallergenic metal that is food and skin safe and will not tarnish. Your item will look very similar to the one pictured, but due to the nature of the process, slight variations may occur. This only adds to the uniqueness and one-of-a-kind quality of your item! By purchasing this listing you are agreeing to the current shop policies and shop announcements. Please make sure to read the listing carefully and follow all instructions in the ordering of custom pieces. Thanks! 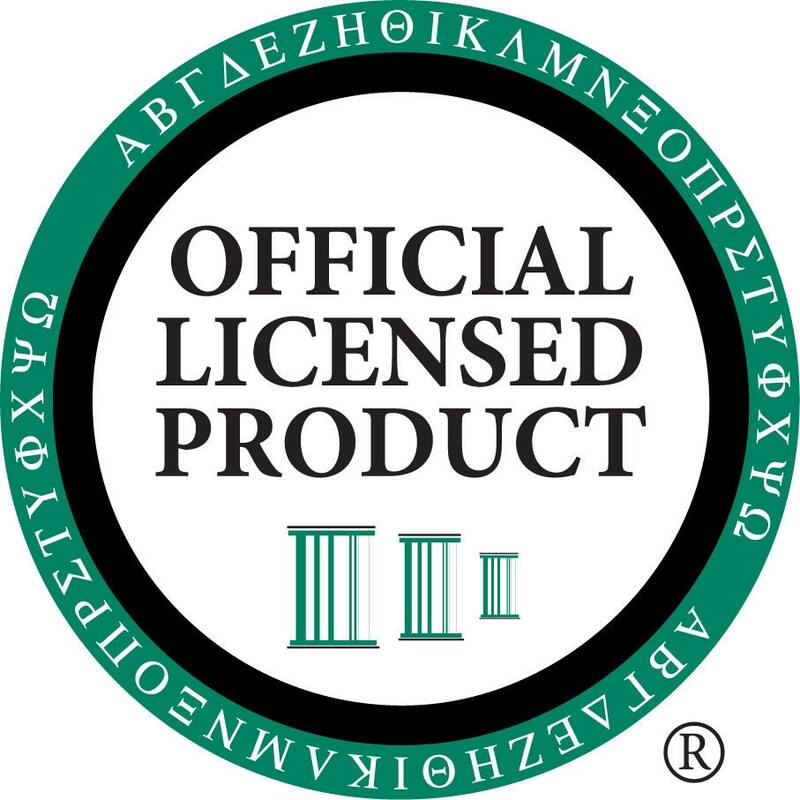 Katy Ryan Designs is an Official Licensed Vendor for the sororities listed and a portion of each sale goes back to support your sorority or fraternity! Don't see your sorority? Message me and I will let you know if I plan to become licensed for that organization! At Katy Ryan Designs we take your personal data very seriously. In order to comply with the EU GDPR Law, we issue the following statement which we agree to uphold when you place an order with us. In order to fulfil your order we rely on Etsy.com to provide us with the necessary data needed in order to process your order in a timely manner. The data we collected is your name, address, email address, additional contact information, and any pictures or personalization that may be necessary to complete a personalized order. We may also contact you for additional information such as personalization or pictures for custom items ordered. This information is required and stored for tax and business related needs, to complete your order in a timely manner, and for compliancy with Etsy’s privacy policies. You may revoke your consent at any time and have the right in detail to request details of the information we keep. We understand the importance of keeping personal data secure and safe and only share limited personal data with companies we need to in order to maintain our business. To fulfil your order, you must provide me with certain information (which you authorize Etsy to provide to me), such as your name, email address, postal address, payment information, and the details of the product that you’re ordering. You may also choose to provide me with additional personal information (for personalized orders) if you contact me directly or include additional personal information in the notes section of your order. •Business transfers. If I sell or mergy my business, I amy disclose your information as part of that transaction, only to the extent permitted by law. I may store and process your information through third-party hosting services in the US and other jurisdictions. As a result, I may transfer your personal information to a jurisdiction with different data protection and government surveillance laws than your jurisdiction. If am deemed to transfer information about you outside of the EU, I rely on Privacy Shield as the legal basis for the transfer when using Microsoft OneDrive, as Microsoft’s Cloud is Privacy Shield certified. When using Apple iCloud, I rely on Apple’s end-to-end encryption for privacy. iCloud secures my information by encrypting it when it's in transit, storing it in iCloud in an encrypted format, and using secure tokens for authentication. For certain sensitive information, Apple uses end-to-end encryption. This means that only I can access the information, and only on devices where I am signed in to iCloud. No one else, not even Apple, can access end-to-end encrypted information. •Change, restrict, delete. You may also have rights to change, restrict my use of, or delete your personal information, Absent exceptional circumstances (like where I am required to store data for legal reasons) I will generally delete your personal information upon request. • Object. You can object to (i) my processing of some of your information based on my legitimate interested and (ii) receiving marketing messages from me after providing your express consent to receive them. In such cases, I will delete your personal information unless I have compelling and legitimate grounds to continue using that information or if it is needed for legal reasons. • Complain. I fyou reside in the EU and wish to raise a concern about my use of your information ( and without prejudice to any other rights you may have), you have the right to do so with your local data protection authority. For purposes of EU data protection law, I, Kathryn Ryan, am the data controller of your personal information. If you have any questions or concerns you may contact me at katyryandesigns@gmail.com or directly from katyryandesigns.etsy.com using the Contact button. Do shipping upgrades change my processing time? No. Upgrading your shipping does not speed up the posted processing time. Please feel free to send us a message if you need your order shipped faster than the posted turnaround time and we can discuss rush processing options. We currently sell on Etsy Wholesale! If you do not have an Etsy Wholesale account, you can message us for a link to our line sheet. We offer up to 50% off wholesale orders. Wholesale orders do have order minimums and other restrictions. Please message us for more details. Do not hesitate to message us to discuss custom and personalized orders! Almost anything can be customized and we would love to work with you to make exactly what you are looking for. My order was marked delivered, but I have not received it. What can I do? If your order is marked delivered, but you have not received it, please contact me within 5 business days of it being marked delivered. We can discuss necessary steps and actions to take next and also discuss a replacement package if our efforts to locate your package are unsuccessful. Please following the tracking of your order to make sure you are aware of the estimated delivery date and when it is marked delivered. You can also enable delivery notifications through the Etsy mobile app. Unfortunately, due to the logistics of shipping in our studio, we are unable to change shipping addresses after an order is placed. You will have to place a second order with the correct shipping address. After the second order is placed, your first order will be refunded and cancelled. It is very important to make sure the shipping address is correct upon ordering. Thank you for your understanding! I gladly accept returns, exchanges, and cancellations. Just contact me within 3 days of delivery and ship items back to me within 14 days of delivery. Buyers are responsible for return shipping costs. If the item is not returned in its original condition, the buyer is responsible for any loss in value. Upon return of the item in its original condition, buyer will be refunded the total of the item(s) refunded minus any shipping charges from the original order.